Group companies are involved in the development and distribution of industrial pumps, pumping systems and high-tech equipment for quality control and research and development into solid material (solids sample preparation and analytical technologies). Amongst Verder’s most successful of pumping solutions is its innovative Verderflex peristaltic hose and tube pumps range. Verderflex is a core Verder group brand of peristaltic pumps. Verderflex offers solutions for a wide variety of applications and industries such as chemical manufacturing, food production, environmental remediation, water treatment, mining and general manufacturing, whilst also developing custom OEM solutions. Verderflex peristaltic pumps are manufactured in the EU within ISO 9001:2008, ISO 14001 and ISO 18001 accredited facilities, and the products have a range of food and similar industry specific certifications. Verderflex peristaltic hose and tube pumps are the ideal solution for ‘difficult to pump’ liquids with high solid content. These range from smaller vending machine OEM pump modules and precision metering tube pumps to the world’s largest high-pressure hose pumps pumping dense, solids-laden, mining-thickener slurries and highly abrasive, viscous or corrosive liquids. Here is an application story where Verderflex pumps have not only been cost-effective, but also efficient in different processes of anaerobic digestion each with different organic matter. A prestigious brewery based in Norfolk that produces fine-quality real ales has installed an anaerobic digestion (AD) facility for producing biogas to be supplied into the national gas grid. The anaerobic digestion facility is fed with kerbside-collected food waste, food processing waste, supermarket food waste and brewery waste. The organic matter is entered into a feed inlet at the start of the process, where a rotor chopper breaks down the raw material. Verderflex pumps move the chopped slurry from holding tanks and through a heat exchanger to raise the temperature prior to entering the main AD facility. As the hot organic material enters the main AD facility, it is dosed reliably and accurately by a Verderflex Dura pump with an inorganic pH buffer to accelerate and maximise the breakdown of the material. The large mass of organic material is ‘churned’ by Verderflex pumps in a plant room connected through a series of pipes to maximise the surface area and further accelerate the AD process and obtain the greatest yield of heat and biogas. The heat is recycled back into the heat exchanger. Upon completion of the AD process, the digestate and wastewater is pumped from the tank by a Verderflex pump for further use as fertiliser. The final product of biogas is then filtered and processed further ready to be inputted into the national gas grid. The Verderflex range of peristaltic pumps are suitable for pumping abrasive and thick slurries and dosing solutions. Verderflex is renowned in the industry for a high level build quality and reliable operation. In partnership with Naiad Acquatic Environmental Solutions, Verder offer an innovative dosing system allowing both crystal saturation and liquids to be dosed reducing site costs and carbon footprint. This can be used for the treatment of wastewater from the AD process and for the addition of enzyme solutions in the AD process itself. 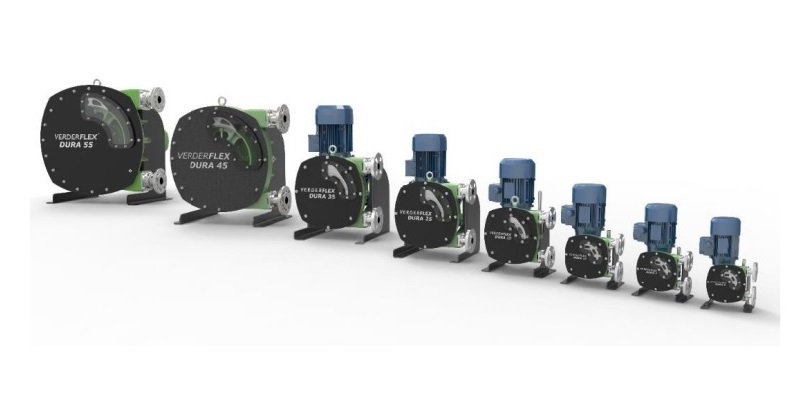 Thus Verderflex’s unique versatile range of Dura pumps has been successfully installed to pump slurries and corrosive fluids generated at various stages in the process of Anaerobic Digestion. The Verderflex Dura is the first real advance in hose pump technology since the high-pressure hose, combining the compactness of a close coupled pump with all the benefits of the traditional long-coupled pump. Smaller pumps minimum flow rate of 23l/hr to industrial pumps with maximum flow rate of 15m³/hr, various hose options like NR, NBR, EPDM, NBRF or CSM and maximum discharge pressure for the range of 16bar a pump from the Verderflex Dura range would be ideal pumping solution for a wide variety of applications. The Verderflex Dura range, with unique technology, is so versatile that it can almost plug-and-play in numerous processes, including oil and gas, mining, water treatment, chemical industry, food and beverage, anaerobic digestion and biogas, automotive, recycling and more.